Most courses have a stretch of holes that amount to gut-check time in your round. It can be a series of holes that play tough under certain course conditions, or as a tricky combination, or they could just be hard golf holes. For instance, the PGA Tour has the Bear Trap, an infamously difficult stretch comprised of a mid-length par-3 over water, a tough par-4 and then another lengthy par-3 buffeted by water at PGA National’s Champions Course in Palm Beach Gardens, Fla. 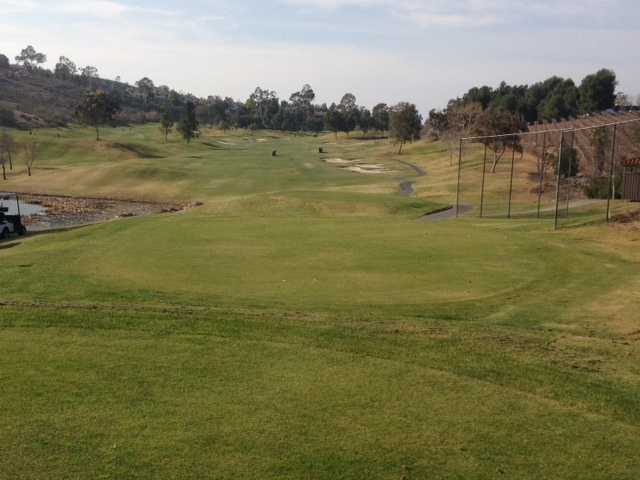 Combined, it’s 803 yards of heart-stopping golf to negotiate. Like I said, you can find these stretches on many courses and often in threes. At The Vineyard in Escondido, I regard Nos. 14, 15 and 16 as the stretch where your round is made or gets away. I look forward to the challenge here every time and while my failures thus far outnumber my successes, especially on the final hole of this group, I at least feel I’ve got a good handle on what it takes to be successful here. The following is my breakdown on this group of holes, including a few playing tips. I forget to get a photo of this hole, but it sets up like this: the fairway bubbles out into a crescent-shaped water hazard on your left and the fairway drops off into an OB and trees on your right. If you’re right, you’ll be lucky if a cluster of saving bunkers actually save you. This is the most demanding tee shot on the course. 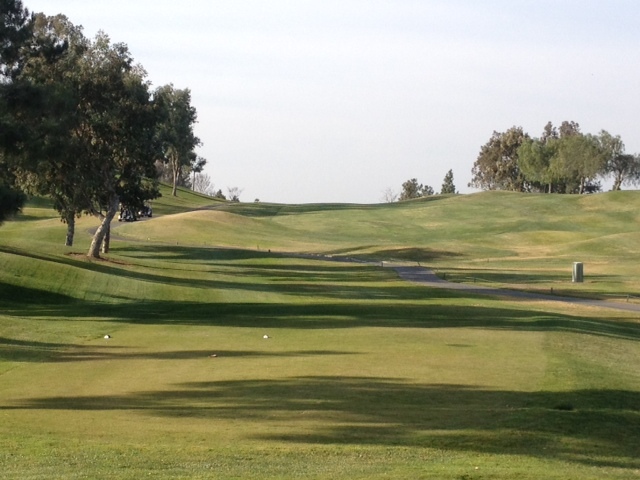 You’re only way home is to hit it straight here into about a 75-yard strip of fairway. The fairway bottle-necks about 130 yards from the hole, making driver a really risky play. A really big hitter may have carried all this once, but I’ve never seen it, much less done it. The play is a hybrid or long iron that hopefully leaves you in play and with 150 yards or so to get home. You only take more club than that if you’re really striping it. Otherwise, you’ll be on way your way to the big number than many take here. Hybrid has long been my play here, but I tried a 4-iron off the tee on Thursday. It hit it solidly down the right side, but I had an undesirable 188 left to get home. With wind at my back, I hit a flush 6-iron that ended up just short and found the front-right sand trip, which is a difficult out. There’s also a sneaky pot bunker lurking back left here. The biggest bummer on No. 14 is to negotiate the tee shot and then give the hole away in a hazard, which is basically what happened to me Thursday. Normally if I’m at 150 yards or less, I’m looking at a nice number here. As a sidenote, the homes (mansions) on this hole spectacular, as is the backdrop. This is the last hole played toward the mountain backdrop that gives the back nine a much different feel than the front, besides the back being nearly 400 yards longer and undoubtedly being the tougher of the two nines. From the tee, this hole doesn’t look like much. It’s just a straightaway par-5 with a cluster of bunkers on the right off the tee and then another cluster left near the green. The trouble can be what you don’t see: a sometimes stiff head-wind. Nos. 15 and 16 are normally played into at least a breeze, making them play even longer than their hefty yardages. I’ve never played this course in the morning, but that’s mostly likely the best time to tackle this stretch. There’s plenty of room off the tee on 15 as it extends into a hilly patch of land behind the 13th green. The trouble with going there, though, is the risk of tricky side-hill lie and possible trees. I find the bunkers on the right more desirable, so I’d favor the right side here and hope you find the middle. Stringing two decent shots together here will put you in prime position for a birdie, and anything less than par here normally feels like a big letdown – especially since this is the only par-5 on the back and of only two on the course – but I’ve seen it done many times and many ways. When the GPS on your cart informs you that this is the No. 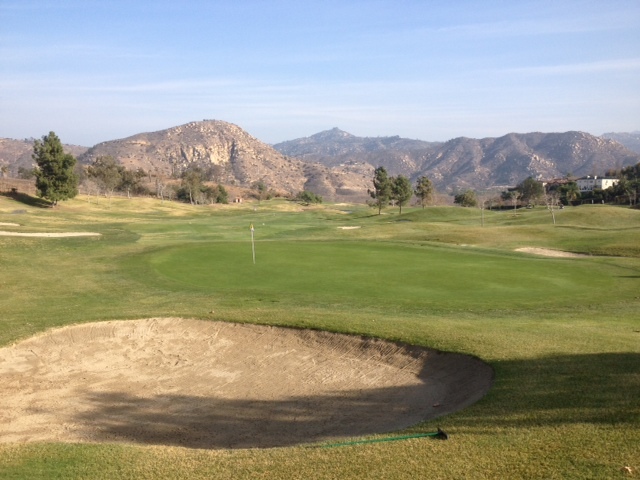 1 handicap hole, it does so with an exclamation point – and for good reason. This is one of my nemesis holes, but I know that I’m hardly alone in that regard. Par is a rare score here and birdies are on the endangered species list. What’s tough about No. 16? Ummm. Everything? It starts with a demanding uphill tee shot, often into the wind. Because of the slope, you don’t get much roll-out here and when you hit the fairway, it seems you’re always about 15 to 20 yards short of where you’d like to be. The second shot is daunting because of a huge sand trap in front and because you may have as much as long-iron or even hybrid in hand if you’re a short-hitter. I’ve often doubled my fun (heavy sarcasm) here by pushing my tee shot right into a stand of trees and sometimes the 11 fairway. By doing this one day, however, I actually discovered a risky route home that you can actually executive intentionally. If you go right, through the trees, you catch a sidehill. If you don’t end up tree-trapped, you can end up within about 140 yards of this green on the right side. It’s a much friendlier attack angle than what get in the fairway since you probably take the front trap out of play and you have a sizable green to work with. I’ve nearly parred the hole this way. I’ve also nearly parred the hole playing straightway. But I’ve ALWAYS bogeyed this hole no matter what. Many people consider bogey victory here, but I’m determined to make par or better at No. 16 in 2014. I’ve you had success at No. 16, please post details in the comments and let us take inspiration from your achievement. I don’t always play it well, but I do really enjoy the back nine at Vineyard and think the downhill par-4 18th is a very cool closing hole. I always look forward to that, especially if I’ve taken my lumps on 14, 15, 16. That stretch seems to need a nickname. The Cellar, perhaps? 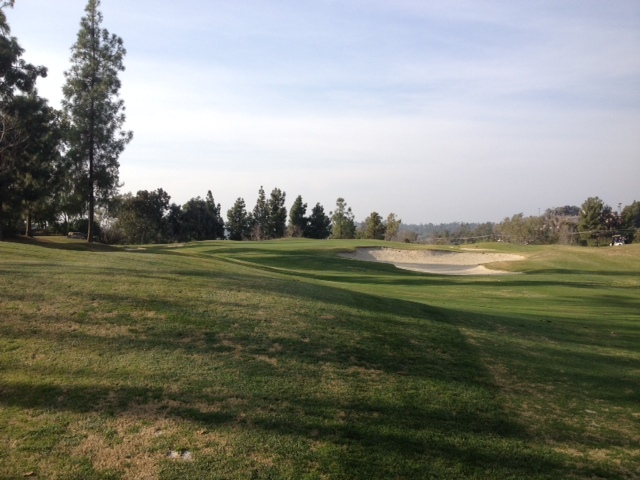 This entry was tagged bear trap, escondido, Jack Nicklaus, vineyard golf course. Bookmark the permalink.